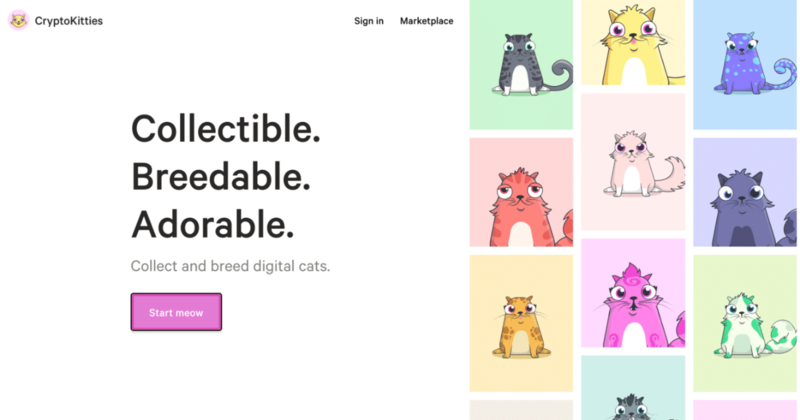 Tokenized digital cats, coined (pun intended) as CryptoKitties, are taking over. There is a digital land where you can collect and breed digital cats and fully outfit them in KittyHats attire, enter them in a KittyRace, and even take part in a KittyBattle which consists of contests such as a Miss Kitty Beauty Pageant. CryptoKitties are part of Axiom Zen, a Venture Studio who specializes in “New venture creation, building products and companies at the cutting edge of technology”. Think of CryptoKitties like Beanie Babies, but virtual and blockchain-based. CryptoKitties is one of the first games built on blockchain technology and they are on the pursuit to make blockchain “Accessible and relevant” to everyday consumers (NYT). People often associate blockchain with Bitcoin and Ethereum, and while CryptoKitties is based on Ethereum, the creators are adamant about noting that CrypoKitties is not trying to be a transactional currency, but instead, stored value. When Shirley and Shih sat down to talk all things CrypotKitties, they spoke feverishly about how API’s have led to an entire ecosystem being built on top of CryptoKitties. Each CryptoKitty is unique and ownership can be tracked. They have a core “DNA” on the blockchain and breeding them produces kitties with more desirable traits than others. They consider CryptoKitties a “Cryptocollectible” rather than a “Cryptocurrency”, and by building it on blockchain technology, it allows users to have “…Identity-based control over digital assets, instead of account-based control” (TechRepublic). Ultimately, CryptoKitties yield an enormous amount of power. They’re intriguing, addictive, and gamified. As people look to buy, sell, trade, and collect them, they also go through the process of getting a digital wallet and acquiring ether (the token that allows for purchases). CryptoKitties seems to be achieving exactly what they set out to do: finding a way to expose the everyday consumer to blockchain technology. The star power of CryptoKitties recently reached new heights with the announcement that Golden State Warriors NBA player Steph Curry would be the first celebrity to get their own CryptoKitty. The celebrity-branded CryptoKitty, “Presents an opportunity to squash the crypto-nerd stereotype and gain more mainstream acceptance”, said Shirley during the fireside chat. This is the first launch in an effort to add more branded tokens, as well as approach and introduce more blockchain technology in a consumer-friendly way. According to VentureBeat, CryptoKitties has gained more than 1.5 million users who have conducted more than $40 million in transactions since March. The launch of the Steph Curry CryptoKitty will surely surpass the price of what some of the game’s most popular cats have gone for, which equates to more than $200,000. Shirley and Shih were especially excited about the partnership with Curry because of his current endeavors and enthusiasm within the technology sector. Shirley emphasized that as big as Curry’s star power is, it really was a matter of securing a partnership with someone who also saw the value and innovation of CryptoKitties. “Our application process is grueling”, Shirley stated at the fireside chat. Applicants go through as many as six interviews, and sometimes they’re not even offered a job at the end of it. The reason for this, said Shih, is that much of CryptoKitties success has been driven by a strong workplace culture, which comes down to hiring the right people and building the right teams. The thing they want every employee to feel? Ownership. Shih, who went through the hiring process himself, said that as soon as he was on the team, he was free to run. Part of the benefits of taking so much time to find and hire the right people is that right out of the gate, employees are trusted to make decisions and feel empowered to innovate. During the chat, they drew parallels to how each CryptoKitties team member is steadfast about having ownership because being the creator and being the consumer are not entirely different experiences. Gaming allows for ownership and extensibility—gamers will not accept guarantees, and that’s similar to building a product or technological feature that allows it to live beyond its creators. By the end of the hour and a half long chat, it was clear that CrypoKitties is not just a cute project trying to be a part of a fad or grip people’s attention for a short timespan. They want to make blockchain technology accessible to everyone, and as they work to turn their product into a category, they do not just want to exist in the universe, but create something entirely new: a kittyverse.